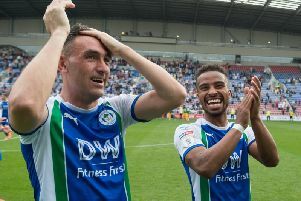 Leeds United manager Marcelo Bielsa was quick to point out Wigan Athletic were missing their first-choice attacking quartet despite seeing his side move top of the Championship with a 2-1 win at the DW Stadium. The visitors recovered well from going a goal down inside six minutes to Reece James’ brilliant free-kick to secure all three points thanks to Pablo Hernandez and Kemar Roofe. “If we look at the chances we created, chances they created, possession...we should have scored more goals,” Bielsa admitted. “But it was very important to win, especially having only drawn a home in our last game. “One of our goals is to prevent the opposition having the ball. “If we can prevent the opposition making passes, if we can recover possession quickly, we feel safer. Bielsa pointed to the return of Barry Douglas on the left-hand side as a key reason for his side’s victory. “Douglas imposes his experience on the left-hand side of the field,” Bielsa added. “He helps our style of play, players like him have the ability to make other players play better.